The challenge and frustration owners often face with their dog's behavior really comes down to communication: how can I communicate to my dog that sitting is a behavior I want, and jumping is a behavior I don't want? If English/talking isn't a first line option ("Do Dogs Understand English? "), and dogs are primarily motivated to please themselves ("Do Dogs Want to Please?") how can we use these realities to our advantage? Can we use the dog's desires to communicate? 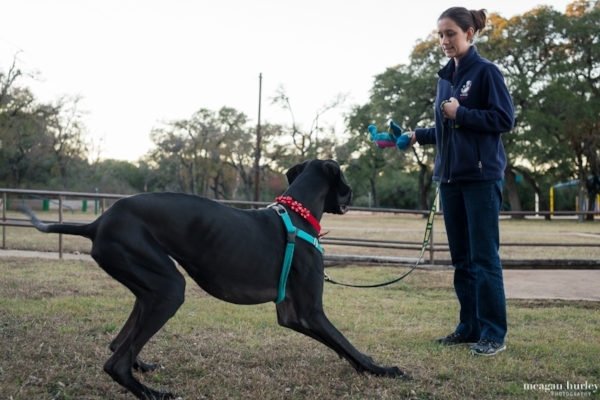 One thing trainers ask themselves is, "How is my behavior affecting my dog's behavior? More specifically, "how are my responses affecting my dog's behavior?" Let's take scratching at the crate door for example. If I open the door, the scratching is encouraged: the dog wanted out, he scratched, and I responded by opening. If I wait for four on the floor and then open the door, the scratching is discouraged. No English or treats were used, and it wasn't a formal training session. However, the communication was clear and humane, and "training" happened. When we know what the dog wants and control how he gets it, we can use that to motivate him to do what we want. This approach to communication and training is incredibly clear and efficient. I'm not saying you shouldn't train with treats/food rewards. I am saying that discovering and including your dog's desires in his reward system (that includes food) makes you a more effective trainer. What desire does my dog have that's making him do this? What happens immediately after the bad behavior? Can I control his access to the desire? What do I want him to do instead? For more on this topic, check out the 4Paws University Facebook post on the Premack Principle. **Important Note: I'm also not suggesting you discourage behavior by using pain or fear. Those tactics often seem to fix the problem, but they eventually backfire and cause more serious problems. As a professional trainer, when I want to discourage a behavior, I withhold something good rather than apply something bad. In our crate example, the dog exits (the good) when he has four-on-the-floor. I withhold the exit (the good) when the dog is scratching.